Since 1784, when the American ship Empress of China arrived in Guangzhou, Chinese-American relations have experienced advances and setbacks. As the Chinese economy rapidly expands, China assumes a more dominant position in world politics, and continued fruitful relations with the United States are a primary concern for both nations in the twenty-first century. 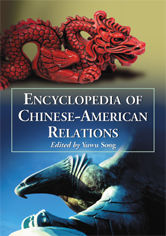 This encyclopedia contains more than 400 descriptive entries of important events, issues, personalities, controversies, treaties, agreements, organizations and alliances in the history of Sino-American relations, from Chinese and American perspectives. Also included are maps, a chronology, a list of acronyms, and three appendices (American chiefs on missions to China, Chinese chiefs on missions to the United States, and the correspondence of Wade-Giles to Pinyin).